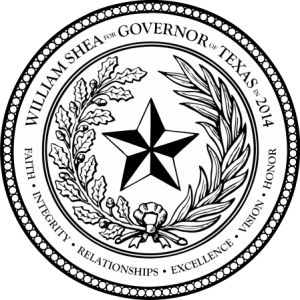 Small Business Owner | The campaign to elect William Shea governor of Texas in 2014. From the ages of 15 to 19 William spent his summers in international relief work in Mexico, Thailand, Haiti, Panama, India, Guatemala, and El-Salvador, and in 2000 he was awarded the President's Call to Service Award for completing over 4000 hours of community service. William was joined in marriage with his wife Roxanne Delilah Bledsaw on December 1st 2005. The two had their first child, Gregory Cale, the following year and a daughter, Miranda Nicole, in 2010. The Honor Academy is a one-year Texas Christian internship. This internship is focused on deepening its attendees walk with the Lord and laying an unshakeable foundation in Christ that will launch them into the rest of their life. Participants are also involved in serving the ministry of Teen Mania through Acquire the Fire, Global Expeditions, School of Worship, Center for Creative Media and Extreme Camps. The Honor Academy’s Christian internship is designed to cultivate and develop leadership potential in young adults. The scope of this discipleship program is extensive and will prepare high school graduates to impact today’s world for Christ while including classroom instruction, practical hands-on experience, and life-transforming events. The entire Christian internship is designed to give interns at the Honor Academy a balanced, strategic approach to godly character and lasting leadership skills. The Honor Academy inspires passion for God and passion for His people.